Since the late nineteenth century, the members of the Roque family have carried on the tradition of distilling from father to son. 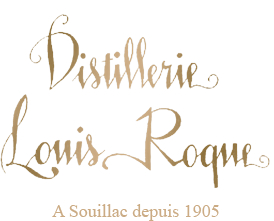 In 1905, Louis, the third of five generations, decided to start his own distillery in Souillac on the site of an ancient convent. Souillac is in the heart of the Quercy, not far from the Cahors wine appellation, an area also rich in gastronomic delights such as black truffles, walnuts and plums. Louis Roque became the local specialist of plum brandy. He kept his production in oak casks where the spirit aged slowly, under his close supervision. In 1995, the company, now under the direction of the fifth generation, built new aging cellars in Souillac. La Vieille Prune (literally The Old Prune) is a plum brandy, made by crushing three varieties of fresh plums: The Ente (a red plum used for Pruneau d’Agen), Mirabelle (yellow plums most famous in the Lorraine) and Reine-Claude (green plums grown all over France). The pits are mostly removed and the resultant juice is fermented so that plum wine is created. This wine is then distilled twice in a copper pot still (like cognac). After the second distillation, the alcohol reaches 70% alcohol by volume. The spirit is then placed in 400 liter oak casks; with time, it begins to gain color and lose its alcohol. Little by little, water is added to the spirit to further reduce its alcohol level to 42% alcohol by volume. After being aged for a minimum of four years, it is bottled with a cork. All bottles are then waxed by hand. From its light amber color come complex aromas and flavors of fresh plums, pit fruits (cherry, plums), a touch of vanilla, orange peel and spice.